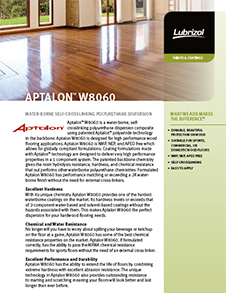 Aptalon™ W8060 by Lubrizol is a water-borne self-crosslinking polyurethane dispersion. 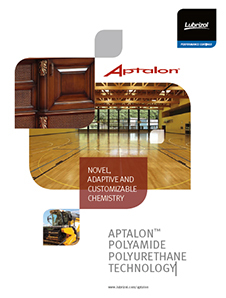 It uses patented Aptalon™ polyamide polyol technology. This NMP-, NEP-, APEO-free grade is designed for high performance wood flooring applications. Coating formulations designed using Aptalon™ W8060 deliver very high-performance properties in a 1 component system and finishes perform well in high traffic environments. It offers hydrolysis resistance, hardness, and chemical resistance. Suitable applications include interior wood finishes for high demand applications, original and refinished wood floors. It has a shelf life of one year.